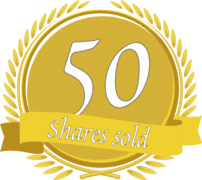 OSADL has reached an important milestone: As of February 2013, a total of 50 OSADL shares are held by 42 regular members. Compared to the eleven founding members, this is a nearly 400% growth. In addition, OSADL has academic and sponsoring members. Thank you for joining and helping to make OSADL stronger than ever! This will enable us to provide even more services for the industry to use open source software in automation and embedded systems. OSADL also has two new sponsoring members, GNU/Linux IT Consultant Christoph Fritz, Germany, and Armijn Hemel's Tjaldur Software Governance Solutions in the Netherlands. The main purpose of OSADL is to assist industry using open source software for production and in products. By doing so, OSADL focuses on software and services that are required by many companies in a similar way. The economical benefit results from avoiding unnecessary parallel work and sharing the costs of common activities among all OSADL members. In addition, OSADL provides software and services required by a particular company only, but this is contracted individually and not debiting the common fund. provide networking, training and marketing support. The more members we have, the more services we provide and, most importantly, the higher is the benefit of every single member, since the individual contribution of a member remains constant. This is the reason, why – with a little weakness in 2008 – we were growing constantly. There is no reason to wait any longer. 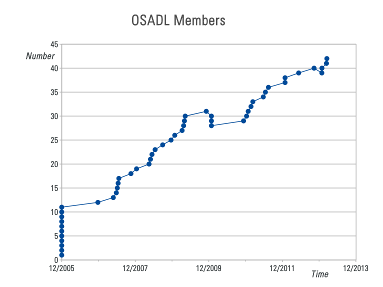 Join us and profit from the many benefits of an OSADL membership.